Garam masala is a commonly used Indian spice blend that includes ground peppercorns, cloves, cinnamon, nutmeg, cardamom and bay leaf. Other spices such as cumin, coriander and fennel or caraway seed are often used as well. Garam masala can be added at either the beginning or end of a recipe. Because of its popularity, there are actually many western spice brands that offer garam masala and it can frequently be found in western grocery stores. That said, you can always get it at an Indian market if you're having trouble finding some. Funny story about garam masala: the first time I bought it, I staged a taste test between it and the generic "curry powder" I had gotten from a supermarket. The stuff labeled "curry powder" tasted a lot like the garam masala, only it seemed to be diluted with some kind of bland, flavorless, dusty-type substance. Since then, any time I've come across a recipe that calls for curry powder (which is not an actual Indian ingredient, by the way) I just substitute it with garam masala. I suppose you could also go the other route and substitute garam masala with a larger portion of curry powder if that's all you have on hand, but who knows what they put in that stuff? Asafetida (a.k.a. asafoetida or hing) is an oniony seasoning that is used in small quantities in Indian recipes. It is known to aid in digestion and reduce gas, which is probably why it's commonly employed when cooking lentils and other vegetable dishes. It isn't very easy to find asafetida in western groceries, although if you shop at a store with a large spice collection, you might check for it. Otherwise, you should look in an Indian market or specialty gourmet-type shop. Hoisin is a thick, dark sauce used in Chinese cuisine as part of a dish or for dipping. 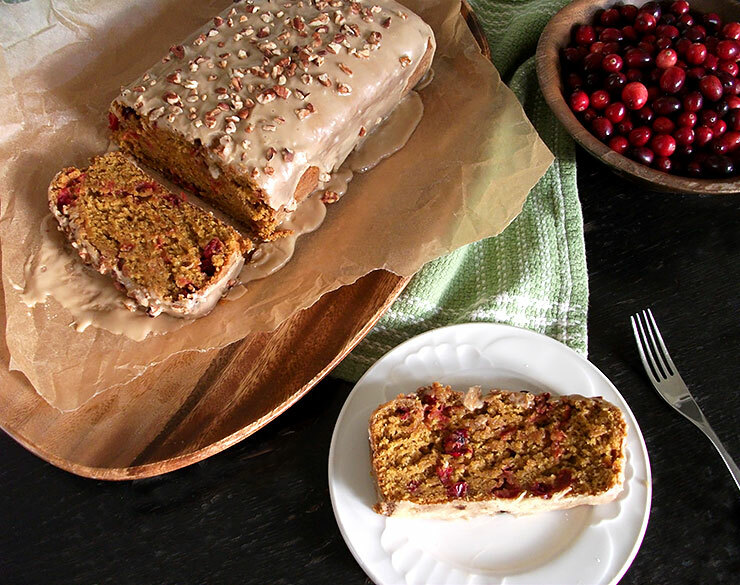 Its trademark sweetness comes from sweet potatoes. You can find it at Asian markets or sometimes the international aisle of a conventional grocery store. Smoked paprika is made from peppers that have been dried and smoked, thereby giving your food an irresistible aroma. It's great for adding a deeply exotic element to your dish. It can be difficult to find smoked paprika in the spice aisle of a conventional grocery store. You may need to look for it at a specialty spice shop, gourmet foods store or ethnic grocery. When searching these places, keep in mind that the Spanish word for paprika is pimentón. Nori is a type of seaweed that is most well known for its use in sushi making. It can also be used as a garnish when cut into thin strips. To do this, fold a sheet of nori into a smaller square or rectangle, then cut it into strips with a pair of scissors. Nori can be found in asian markets and natural food stores. Korea's national dish, kimchi, comes in many, many different styles and varieties. The only universally accurate way to describe it is, perhaps, as a pickled vegetable dish. The type of kimchi that most people will likely recognize is made with Napa cabbage and spicy red chili flakes. Contrary to popular western belief, kimchi is not made from food that has been buried underground - that is, not anymore. Since modern technology now provides us with shelter from the heat of the sun, most people just let their kimchi ferment on the counter or in the fridge. Another myth about kimchi is that it always contains fish. Although seafood ingredients are often popular in many types of kimchi, every type I've ever found at a grocery store has been vegan. I've found vegan kimchi in the refrigerated produce sections of asian markets, natural food stores and conventional groceries. That said, I don't buy my kimchi at the store anymore since I learned out how fun and easy it is to make at home. 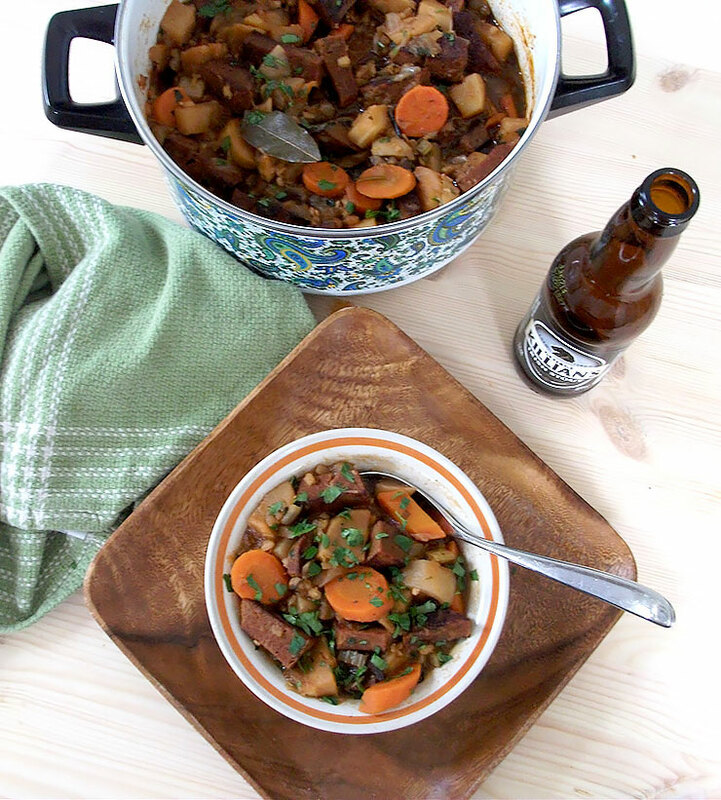 Use mushroom broth in place of vegetable broth when you're looking for a more robust, "beefy" flavor. Chinese five spice powder is a traditional spice blend that contains star anise, fennel seed, cloves, cinnamon and Szechwan pepper. It can be found at most stores that sell a wide variety of spices. ACK! Why are you putting chemicals in your food?? Believe it or not, liquid smoke is all natural. Smoke from wood chips is passed through a condenser, turning it into a liquid. Liquid smoke is a great and easy way to add smokiness to your food when cooking outside simply isn't an option. OK, so where do I find this stuff? You can find it at most grocery stores. It's usually in the same aisle as marinades and barbecue sauce. Chipotles in adobo are smoked chili peppers that are marinating in a tangy, spicy tomato sauce. They are quite hot, so I usually prefer to tear them open and pull out the seeds before using them. Where do I find Chipotle Peppers in Adobo? Chipotles Peppers in Adobo are often found in the International aisle of most grocery stores and in Mexican markets. Tempeh bacon is simply thin strips of tempeh that have been prepared with a sweet, salty and smoky marinade. It can be found at natural foods stores. I've only ever tried the Lightlife brand, but Turtle Island Foods also makes a tempeh bacon that looks appetising. Dry spiced tofu (dou fu gan) is tofu that has been marinated in some sort of spice mixture (often five-spice) and either pressed under great pressure or baked to remove as much moisture as possible. This gives it an extremely dense and "meaty" texture. Where do I find dry spiced tofu? 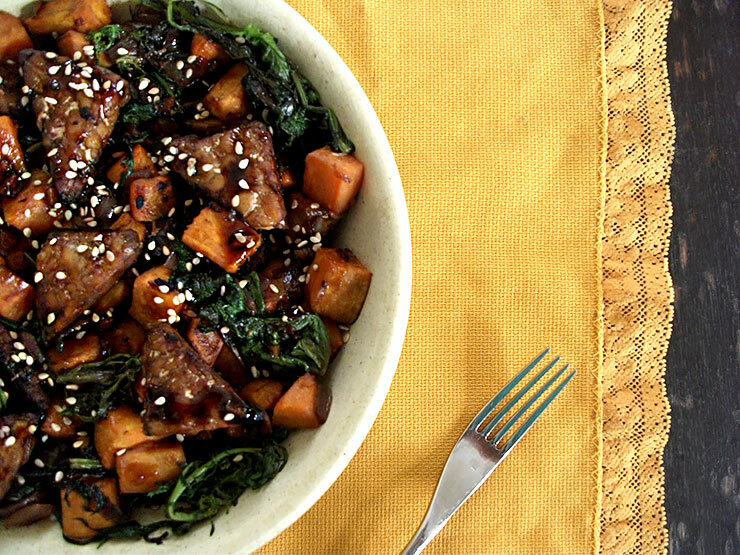 You will usually need to visit an Asian market to find dry spiced tofu. It's sold in the refrigerated section under a variety of names but can easily be spotted if you know what to look for. It comes in the form of reddish-brown bricks or cakes that have been vacuum packed. You may also be able to find baked tofu at natural food stores or conventional grocery stores. It will have a similar texture but often a different taste. West Soy is a brand that makes baked tofu. Mirin is a condiment used in Japanese cooking. Like sake, mirin is made from from fermented rice, but it's sweeter and has a lower alcohol content. Different types of mirin vary by how much alcohol they contain. You can find mirin in Asian markets and natural food stores, or in the international section of some conventional groceries. Soy creamer is like soy milk, only thicker. It can be found at most groceries near the other coffee creamers. TVP, sometimes called "soya", is made from extracted vegetable protein and processed into different shapes. The form of granules or crumbles is popular because it resembles ground meat, although it can also be found in chunks, strips, slices, etc. TVP can be found at natural foods stores as well as Asian and Indian groceries. Although kala namak salt is pink in color, it's often called "black salt" because the whole crystals are black. The salt takes on a pinkish hue when ground. It should NOT be confused with black lava salt, which is an entirely different ingredient. Kala namak has a pungent, sulfuric aroma. Used in small amounts, it smells very much like eggs and makes an excellent addition to egg-substitute dishes like tofu egg salad and tofu scramble. You can find kala namak at Indian groceries or gourmet/specialty foods stores. Unfortunately, the most popular brands of chocolate chips contain milk and/or butterfat, so you'll have to seek out the lesser-known alternatives for your baking needs. The best place to look is at a natural foods store, but if you have a hard time finding them, you can also look for dark chocolate bars that are vegan (read the label) and cut them up into small pieces. Note: "cocoa butter" is a vegan ingredient. 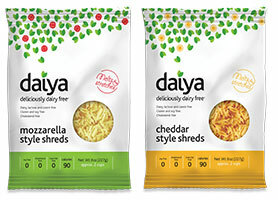 Although a number of brands have tackled the challenge of making a vegan cheese, Daiya is currently the most successful contender. Their products taste better than the alternatives, and they also melt. The shreds aren't meant to be eaten raw, though, so if you want a cold cheese, try their wedges. Daiya can be found in natural foods stores. The purpose of oyster sauce is to add savory and salty flavors to your food. A proper vegetarian oyster sauce will do this too, often with the help of mushrooms. There are many different brands of vegetarian oyster sauce, and they don't always taste the same, so you may end up having to adjust the seasoning of your dish. Look for vegetarian oyster sauce at an Asian market. If you aren't able to get ahold of any, you can just use soy sauce as a substitute. 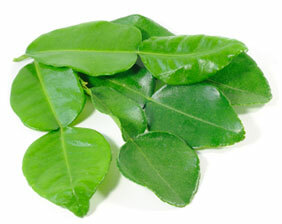 Kaffir lime leaves impart a very particular fragrance and flavor to Thai dishes that can't be easily substituted. You'll have to get them at an Asian market, and you'll want to buy them either fresh or frozen. The dried ones won't taste the same. If you have a hard time getting ahold of them, add some lime zest instead. It will help, but it won't taste entirely Thai.